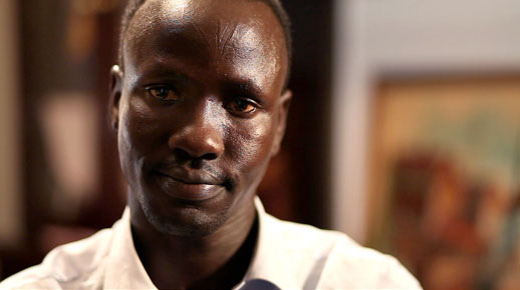 Deng grew up on his family’s farm in South Sudan, where his father grew bananas and other food crops. The Sudanese government began destroying villages in 1985, leading to the rise of the People’s Liberation Army. Two years later, the army told Deng’s mother she would have to give up her eldest son. At just six years old, Deng – along with two of his nephews – was conscripted. He went through military training, witnessing multiple atrocities over several years of service before being shot in the back while running through a village. Two years later, after a chance meeting, his brother helped smuggle him out of the country by hiding him in a corn sack on the back of a truck. The two brothers befriended an Australian family and arrived as refugees in 1998. After working at a local service station to learn English, Deng enrolled at TAFE and completed his Advanced Diploma in Accounting before deciding in 2005 to study a Bachelor of Laws at university. The first person in his family to graduate with a law degree, Deng now works as a lawyer in Bankstown, ensuring Sudanese people have the legal advice they need before entering the court system.